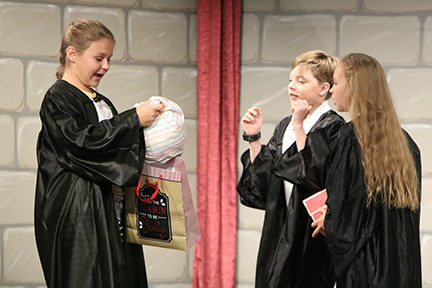 Middle School actors (left to right) Izzie Garrett, Kayden Kordsmeier, and Sophia Scholz are seen here in the Drama Club's last performance of "Sally Cotter and the Censored Stone" on stage at the Spiritan Center October 14. It had a three-day run and was directed by Ms. Rosalyn Williams. The play was a parody of the Harry Potter stories and was written by Dean O'Carroll. The presentation was made possible by a grant from the Art Rajin' Cajun Board.